I can't call it a rock garden, because it's not a true rock garden filled with unique alpine plants. It's mostly ground covers that are comfortable with shade. But it is a garden of my prized rock collection. 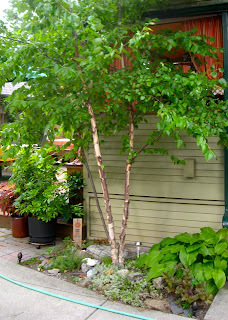 A few years back on a trip to Plymouth, MA, we took a few rocks from the beach we visited for this other-wise neglected area of the garden boxed between the driveway and house, but hosts a pretty, three-trunked River Birch. I liked the idea of having my own "Plymouth Rock." Since then, on trips, when feasible, my daughter and I have started picking up a rocks for the collection. The most recent purchase? A small chunk of the Berlin Wall. At least we assume it is real, it was purchased in a gift shop across from Checkpoint Charlie. It has papers! 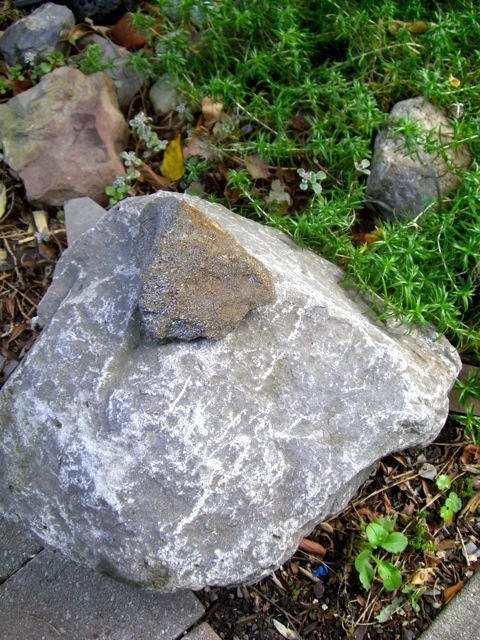 My most cherished rock (not seen here) is one of the rocks that formed the fire pit at my family's lakeside cottage outside Greene, NY. It's burned, black, scarred and broken. It has nearly 40 years worth of bonfires, s'mores, beers, wine, clam bakes, cousins, friends, nieces & nephews, aunts & uncles, a sister & brother, and mom & dad embedded in it, along with having heard thousands of conversations both inanely juvenile and thought-provoking. It's the only rock like it on earth. 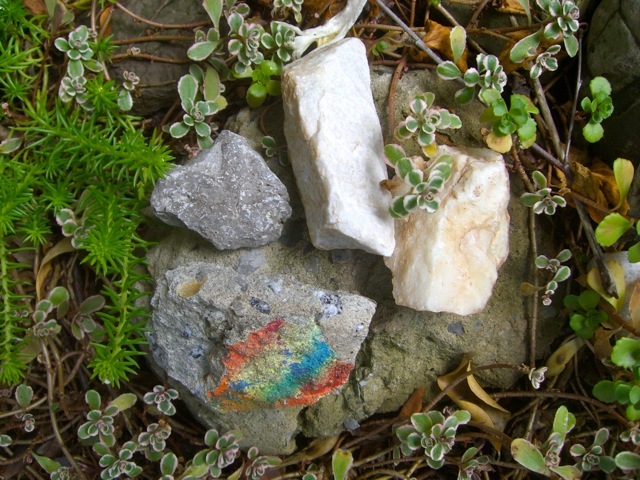 Seen up top (clockwise from top): marble chip from the Parthenon on the Acropolis, Athens, Greece; a marble chip from the Temple of Poseidon in Soúnio, on the coast of Greece; a piece of the Berlin Wall from Berlin, Germany (with graffiti); a stone from the Alps around Lake Königssee, Berchtesgaden, Germany; and they're all sitting on a chunk of foundation block from Frank Lloyd Wright's Darwin Martin House (it came with provenance papers). 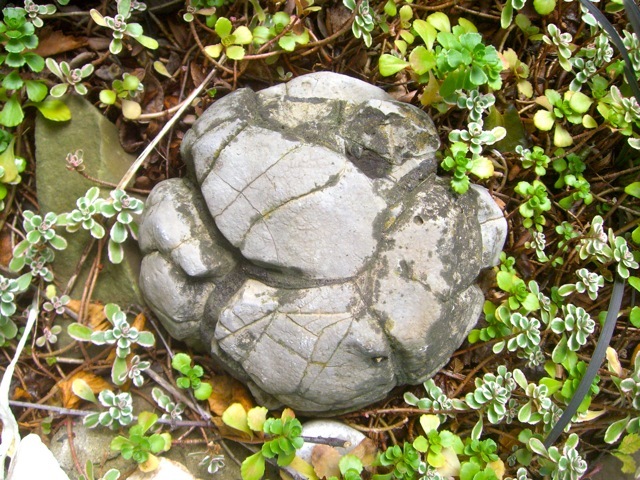 Below: A "turtle rock," a glacial-formed rock unique to this area. A gift from Stan Swisher, the man in charge of the Erie Basin Marina Trial Gardens. Below: Another chunk of the Wright house foundation; resting on top is a sparkly stone from the beach in Sayulita, Mexico. 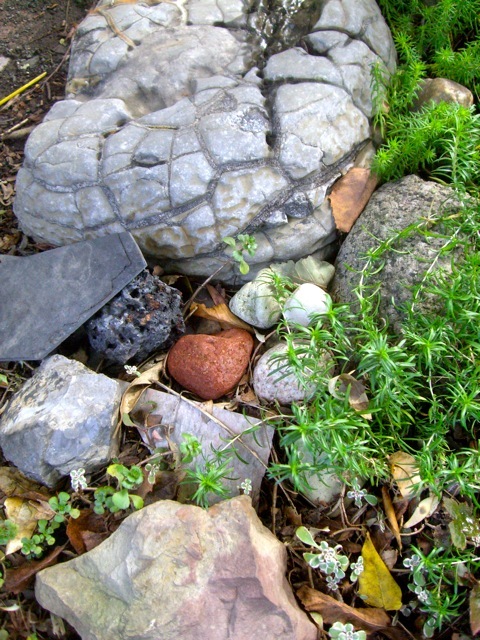 Below: Another (larger) turtle rock; stones from the Niagara Gorge, Cape Cod, Jones Beach on Long Island, and slate pieces left over from weekend handyman projects. 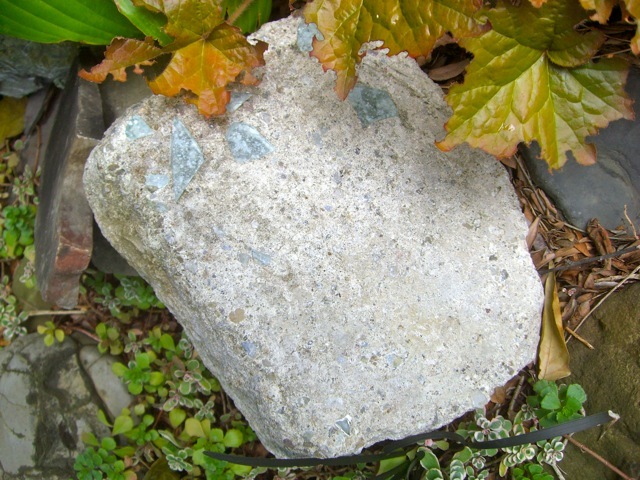 This piece of stone was salvaged from buried sections of original foundations for the Martin's pergola and conservatory (1904). It was recovered during an archaeological dig (2002) of the foundation after the apartment building built on top of it was demolished. The foundation was composed of mortared, rough pieces of locally-quarried Onondoga limestone. I like your rocks. 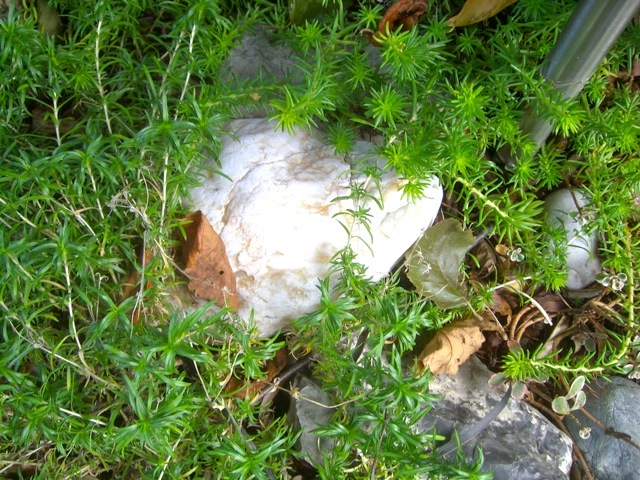 I have some treasured rocks tucked with plants. I can always count on them to look good in all seasons!